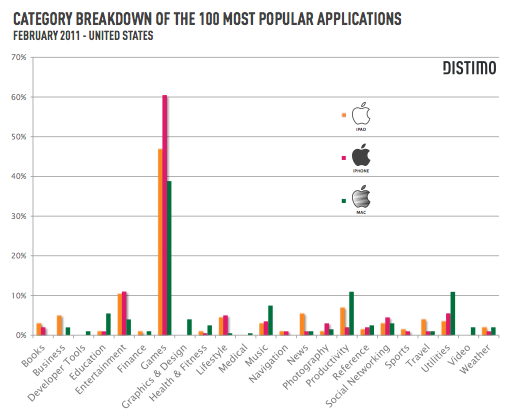 A new market study from app store analytics company Distimo shows that as of the end of last month, the App Store is still the store with the most content, thanks to more than 300,000 iPhone apps, and over 70,000 iPad apps. In comparison, the Android marketplace offers a little over 170,000 apps, and the Mac App Store ‘only’ offers about 2,000 apps. 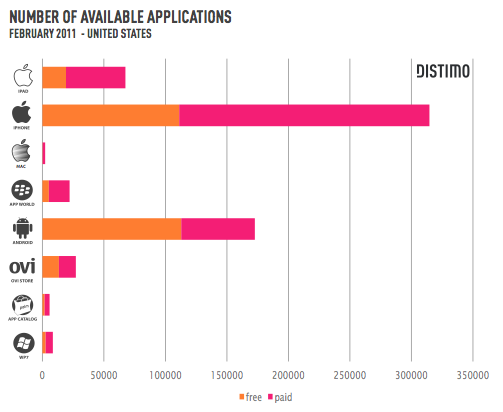 The free/paid apps ratio has been stable since last year, as 65 percent of all iPhone apps are paid apps, while 71 percent of all iPad apps are paid apps, showing that the paid apps model used by the App Store is a sustainable model, unlike the Android eco-system, which seems to favor free apps – only a third of all Android apps are paid apps. iPad users still seem to be willing to pay a premium for their apps, as the average selling price of the top 300 paid apps is $1.57 for the iPhone, and $4.19 for the iPad. As usual, most of these apps are games, and entertainment apps. 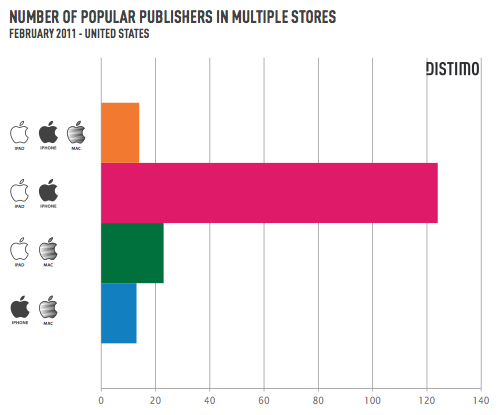 Unlike other more traditional platforms such as Windows, the App Store remains a great way for indie developers to sell their apps, as the top 300 iPhone and iPad apps (free and paid) are published by a whopping 1,014 publishers. Only 123 of them (17 percent) currently distribute apps in both stores, which seems to imply that most iOS developers tend to develop for a single device, iPhone or iPad, and not both.